TL;DR: I’m proposing a redesign of the Comcast cable remote control; a sketch of my concept is in the picture above, on the right. My new remote would be smaller, simpler, and easier to use (in theory). This is a personal project with none of the user research, testing, prototyping, etc. that would be required if this were a professional project. That said, it was fun and I’m glad to share it with you, Internet. Now the long version, for folks interested in the details, designers, and TV remote enthusiasts everywhere! The Comcast* remote control is an incredibly popular (if somewhat mandatory) device in America. Cord-cutting and “subscription entertainment” are both on the rise, but over 20 million households still house a Comcast cable box and one of these TV clickers. And it needs some work. Today’s Comcast remote seems designed to address every plausible use for a TV remote control, featuring 55 buttons in 7 colors on an 8.5" long frame. Considering that a person’s interactions with their living room entertainment are pretty simple (and often repeated daily), that sounds like bad design to me. 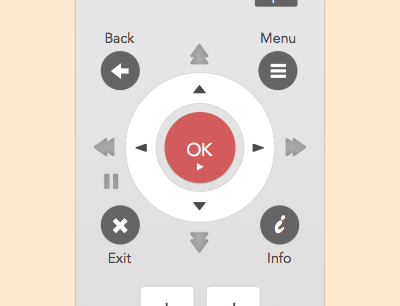 So I’ve taken a stab at a new design: one that streamlines and simplifies the remote in a way that should serve most common customer uses. A personal project. A fun attempt to redo an obviously-bad design, without fear of real-world limitations or consequences from sloppy design. Hooray! A thoroughly-researched user experience design: I conducted one short online survey to validate some assumptions, but otherwise the design is based on my personal experiences, plus comments and feedback from people close to me. I get it, that’s not “real research.” More like “self design.” For this project, I’m ok with that. A design that includes real ergonomics and industrial design: I don’t know anything about actual ergonomics, nor materials, nor the industrial design best-practices for remote controls. I probably broke some rules. I did make some considerations for cost, with the intention of keeping things realistic, but I didn’t create physical prototypes, so I don’t know how it would feel in a person’s hand. An interface redesign for Comcast’s on-screen menus, etc: that UI is similarly horrible, but besides this design’s demand that some buttons be replaced by on-screen controls, I didn’t touch the on-screen UI. That sounds like a project for another time! An innovative “re-imagination” of the TV-consuming experience: I’m working at a very basic level here — plucking low-hanging fruit to optimize a remote within the basic parameters that exist today. Make the clicker better. I’m not even introducing any new physical controls — like dials, joysticks, or touchpads — as I don’t believe Comcast would plausibly add those kinds of costs in making these. Just rubber buttons on a plastic casing, here. A design that considers all of Comcast’s real-world limitations: be they technology, compatibility, regulation, whatever. I don’t work there. I don’t know the details. We’re just having fun here, folks. 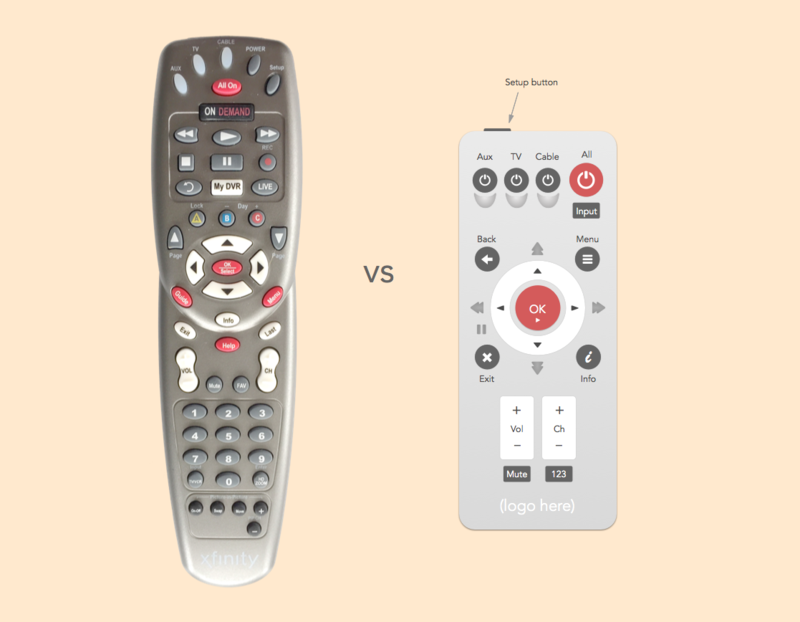 A design that addresses “edge cases”: I’m looking to improve the experience for the “everyday user” here, not the rare user that would actually use all of the features on the current remote. For those home entertainment enthusiasts that want additional features, there are 3rd party universal remotes that are much more capable than the default Comcast remote. Try one! A work of art: I worked through a few sketches and came up with this; the mockup is mostly to illustrate button placement and basic design. I’ve made aesthetic considerations, but have intentionally not focused on that. Now that this doesn’t sound fun anymore, who’s ready to start? I sure am! Comcast’s remote can be used as a universal remote: one that controls your cable box, but also your TV set and a third device. Fancy, right? This is a big consideration in this design; 3rd party devices complicate things. If we were only designing for Comcast tools, we could probably toss most functions into on-screen controls and design something similar to the remotes from the Google Nexus Player or the Amazon Fire TV Stick. ~40% of survey respondents reported controlling their TV sets with their cable (or satellite) remote. The example I used in the question was “for example: when adjusting your TV volume,” though I imagine some people still don’t perceive a distinction between “the TV” and “cable.” But I tried my best. In a surprise twist (for me, at least), ~17% reported controlling a DVD player or VCR with this remote. That’s pretty substantial! Spoiler alert: this convinced me to include a few buttons I would not have otherwise. 6.5% reported not having cable or satellite at all. You kids, with your cable-cutting and your loud music! The “VCR/DVD” playback controls: Or, at least most of them (in the next section I’ll surrender to a few… don’t worry, you VCR-lovers). These take up a lot of space for limited functionality. And who ever needed separate “stop” and “pause” buttons to begin with? For Comcast applications that use these buttons, like the DVR, I’d put these controls into an on-screen display, to be activated by a main button, similar to how the Netflix app on Xbox used to work. See? Easy! The setup button: Ok, I didn’t really remove it, I just hid it on the side of the remote instead. Genius, you say? I know. Really, that’s one of the riskier moves here… for all I know, it could be much more expensive to place a button on the side. But let’s put it on the side for now; the button is important for configuring new devices, but that’s the only time it’s ever used in the user’s ownership of this device, so I don’t think it deserves that high-value real estate on the face of the remote. The “A/B/C” colorful buttons: I never use these; I believe they’re custom-programmable buttons. I bet “the common user” never touches these; for users that do, again I’d recommend getting a 3rd party universal remote. The NEW device power buttons: The “All On” button is great, but A) it doesn’t always work, and B) you’re not always in a situation that requires all of your devices. E.g., you want to watch TV, but not a DVD. Or you’re watching a movie late at night in your apartment, so you don’t want to turn on the big sound system. Individual controls would be handy. At home, I frequently turn my devices on and off using the current method: hit the specific device “select” button, then hit the “power” button. For a common interaction that can span multiple devices multiple times per viewing session, dedicated buttons is a worthwhile addition… I’ve cut plenty of buttons elsewhere. That all said, this is admittedly one of the more “disputable” choices I’ve made here. Device select buttons: mentioned earlier, I actually think these are designed well already. After separating the power buttons (see above), I’d keep these, but change the shape; these are the half-moon symbols below the dark power buttons. Similar to today, they’d light up A) when you select them, and B) when you hit another button after you’ve selected that device, to indicate which device is being affected. Any learnability challenges associated with this would basically be the same as the current ones; I think it’s good functionality, so, lacking a better idea, I’m ok keeping it this way. The redesigned shape might be a challenge in “real life production,” but the idea is to have them closely associated with the power buttons above, so it’s clear that the device titles (e.g., “Aux”) refer to both buttons. The input button: I use this button all the time. Do you? If you use any media devices besides your cable box, I bet you do. I’ve relocated it from the depths of obscurity at the bottom of the remote (located next to some non-related buttons), to a nice prominent place at the top, near other similar functions that are also used to control multiple devices. The Last button: I just renamed this to be a “Back” button and put it in the top-left portion of the wheel (a positioning popularized by mobile apps). The wheel: Everyone loves the wheel! I.e., the circle of arrows that, for media remotes, is a nearly-ubiquitous control mechanism. 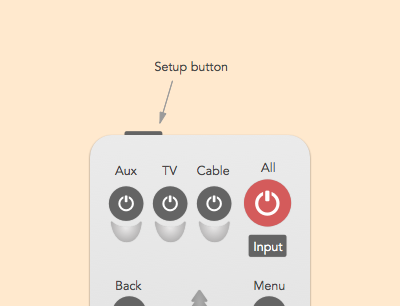 Let’s keep it, but take a style hint from the Amazon Fire TV Stick remote, simplifying it visually by using a plastic circle instead of separate buttons. The OK button: Yep, the big one. I made it even bigger, and doubled up the button functionality by adding the “Play” symbol — I’ll go into more detail about this in a bit, but in testing our Toshiba DVD player remote at home, I found that the play button can actually function in menus as an “Ok” button, so these buttons can be combined… oh, joyous day! The Menu button: mentioned above, this menu button is meant for bigger and better things — this is where you should access the Guide, DVR, Help, etc. With another nod to mobile UI design, I’ve added a “hamburger symbol” (the three horizontal stripes). There are many designers that don’t like the hamburger symbol, but I do. I like actual hamburgers, too. The Exit and Info buttons: I made them more prominent, and included representative symbols. The Exit button does have functionality that’s distinct from the “Back” (or “Last”) button today, and I think it’s always worth providing the user an escape hatch. Let’s keep it. The “Info” button is usable on a lot of screens and menus, today, so it’s worth keeping at around (and making it prominent). The Rewind and Fast-forward buttons: Those are the double-arrow buttons to the left and right of the circle. I added these back in only after seeing how many users control their DVD players (and VCRs) with their Comcast remote (looking at you, ~17%). DVD player remotes today commonly have both “Left” and “Right” buttons (i.e., the circle controls I’ve employed here) in addition to “Rewind” and “Fast-forward” buttons — they serve distinct functions on a DVD player, so they unfortunately need to be separated here, despite the temptation to consolidate. The Pause button: This was the last button I added, very begrudgingly. Similar to the Rewind and Fast-forward buttons, the “Pause” button means something specific for DVD/VHS players, and isn’t commonly doubled up with the “Play” button, so to preserve that function I had to leave it in. The placement is a bit odd, but I was at a loss for a better location. I also went with a unique button shape here to maximize space — another likely-iffy decision that I would revisit given more time. I mentioned before that the “Play” button on a DVD player will actually function similarly to the “OK” button, so I was able to double up those, unlike the rewind, fast forward, and pause buttons. The Page Up and Page Down buttons: I know people that use the “Page Up” and “Page Down” buttons on the current Comcast remote — these let you jump an entire “page” of items when navigating channels or menus. And they do come in handy. The favorites (“FAV”) button: Currently, this is where you can store your favorite channels, then call up that quick list to navigate. I hadn’t seen this ever used before, and am assuming it’s not a popular option. I think “favorites,” “recently watched,” etc., do have a place in modern media navigation, but I mentioned earlier that we’re not doing a big UI overhaul here, just focusing on the remote control given today’s feature set. The number buttons: That’s right… they’re gone! That’s a big design decision that probably wouldn’t sit well with some users (or designers), but it’s only a matter of time before we’ve passed the “channels as numbers” convention for organizing entertainment content. At home we almost never use the number pad, choosing to either navigate content by channel scrolling, or from features like On Demand. I’ll later discuss the alternative to the physical number buttons. HD Zoom: Maybe this is for older DVDs (or VHSs? ), and perhaps a boon for users with poor eyesight, but I don’t see this being used frequently enough to deserve it’s own button — if it’s needed, put it in a menu. The Picture-in-Picture (“PIP”) controls: Despite my best efforts, I couldn’t get this to work correctly on my TV. There may be some sports fans that enjoy functionality like this (i.e., to watch multiple games at once), but again, I don’t see the use case being common enough to justify a whole panel of buttons. If this were a popular feature, a case could be made for just the “PIP menu” and “Swap” buttons. 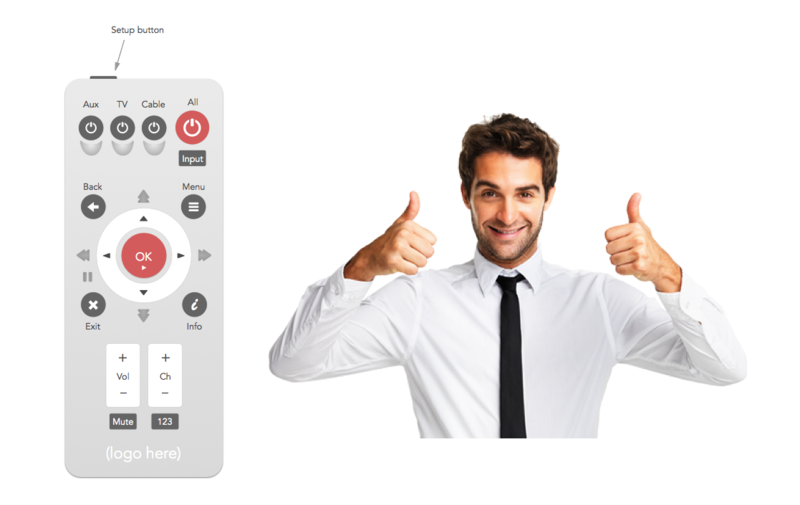 Volume and Channel controls: Convention is a powerful thing, and if there’s one thing people recognize on a TV remote, it’s this volume/channel configuration. The “Vol” and “Ch” abbreviations are used on the current remote. I’m sure people get it by now. The Mute button: Comcast does have this nestled right by the volume control, currently, which makes perfect sense. Good job, Comcast! 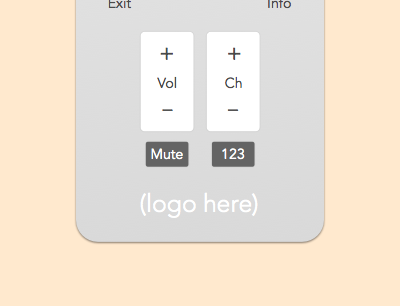 I was tempted to make it even more prominent, as the “mute” function is often needed immediately, but given the lack of distracting elements around it, I went with a simple execution on an existing button shape. A new “number pad” button: That’s the “123” button. This is my attempted compromise in removing the number buttons — hit this button and a 0–9 number pad would pop up on screen, where you can select the numbers. This should be feasible for Comcast’s cable features, and I can’t think of any situations where the number pad is needed for third party devices. Thumbs up! You’ve made it to the end. So there it is: A smaller, simpler, optimized cable remote. It may not look like much, but if you even glanced at this article, you can tell that even small projects can take some serious thought. Plus, incremental improvements can be significant in a device that’s often used daily. Looking past a simple device improvement — a.k.a., moving from one plastic remote to a slightly-better plastic remote — there are some interesting things you could do with new tech. For example, an (optional) smartphone app you could use as a remote. It wouldn’t be the first app of its type (hello, Google Chromecast), but it would be exciting to improve Comcast’s usability with two screens and a dynamic, touchable display. Sounds like another project for tomorrow… keep your eyes peeled. In the meantime, let me give a big “thank you” to the folks that helped me work through this design… and a “congrats” to those of you who’ve managed to read through this whole post! It’s a long one. Please recommend this if you like what you’ve read. Any feedback, critiques, ideas, or other comments you have are very much appreciated… design is ultimately a collaborative process. Follow me on Medium, and feel free to reach out to me directly at couch.ux [at] gmail [dot] com. I’d love to hear from you. P.S. towards the end of writing this, I discovered that Comcast announced a new remote design a few months ago… and it does look like there’s been some incremental improvement. Interestingly, they’ve combined the play/pause buttons; per my earlier comments, I don’t think that will play well with DVD players and such, but perhaps they’ve found a workaround (or they just don’t care). Poor timing on my part! But given the new Comcast remotes are still basically the same as the one I have, and that I made different design choices on my version, I think the work is still relevant.